My mom used to raise enough green beans every summer to put up about 40 quarts! Now that’s a lot of green beans. And it ‘s a bit of work just to get them started, keep them free from Mexican Bean Beetles (another villain on my Top 10 Most Hated Bugs), and pick them. Now imagine how many hours it took to cut off both ends (and string them if they had strings), stuff them in jars and process them in the pressure cooker! But how very glad I was (and am) that she did all that work so we could open the pantry on a cold, snowy, December day and pull out her string beans for dinner. No other canned bean has ever tasted as good to me except, maybe, my own. I love fresh steamed or roasted green beans and I so love being able to walk out into my garden in the early evening and pick the beans I am serving for dinner. Nothing tastes better. And, green beans are relatively easy to grow. Most of us got out first experience with sprouting seedlings by watching a single green bean seed in a Styrofoam cup crack the soil and start rising up to greet the 6th graders who planted it. In my Zone –6a according the updated US Department of Agriculture (USDA) chart — old timers tell you to put bean seeds in the ground when lilacs are in full bloom. This tip is tried and true and it works. I have never lost a bean plant yet. And I’ve gotten a jump-start on being able to harvest and eat them. Beans do best if direct-sowed. And they do best when the soil is at least 60 degrees. That’s why you wait until most of your other crops are in the ground before putting beans in dirt. For me, there are two types of beans – pole and bush. Pole beans produce all season long. Bush beans produce all at once. What does that mean to you? I only put pole beans in the ground once each season. I do succession plantings with bush beans every 2 to 3 weeks so I can keep the harvest going. Whichever type you choose (I do both), they are planted the same way – 1 inch deep. But here they start to differ because of how they grow. Plant seeds of bush beans 2 to 4 inches apart in rows at least 18 to 24 inches apart. Plant seeds of pole beans 4 to 6 inches apart in rows 30 to 36 inches apart. 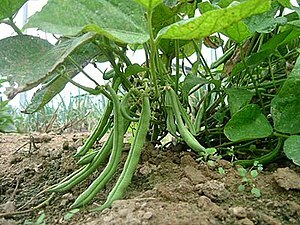 You can also plant pole beans in hills. Put four to six seeds in each hill and make sure your keep 30 inches between each hill and 30 inches between rows. Why different rules for pole beans? Pole beans are prolific but they will take up space in the garden. These plants need some real estate for them to “run” through and a tall enough structure to take the vines they send out. Why? These babies will grow and grow and if you don’t provide a nice, tall structure for them to climb, they will twine together, make masses of knotted vines and pretty much try to produce beans that way. By the way, don’t waste your money buying bean towers. They just aren’t tall enough to take on pole beans. I know, I tried and I lost the battle. I now use 8 foot high fence sections and I still have to direct the bean runners over the top and down the other side. 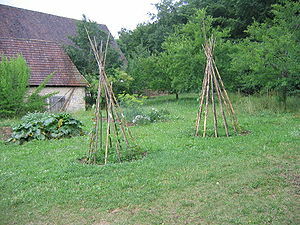 Or use bamboo tepees like those in the picture. Beans are pretty easy keepers but there are a few rules you should know about raising them. Once you plant them, water the seeds into the soil but do NOT over water them. Seeds of most varieties tend to crack and germinate poorly if the soil’s moisture content is too high. For this reason, never soak bean seed before planting. Instead water just after planting or plant right before a heavy rain. Do NOT over water the plants. Their roots are close to the surface and they do like to be moist but use mulch like straw or grass to keep the roots damp. Too much water makes the plants vulnerable to fungal or bacterial diseases like gray mold, bacterial blight, Rust or bean mosaic virus. In most cases, if you are an organic gardener, the only way to rid yourself of these diseases is to remove and destroy the infected parts of the plants or just pull the whole plant out and start again. So, remember, with green beans, a little mulch and a little water go a long way. Feeding is something I’ve never done with beans but you can side dress pole beans with a little compost half way through the growing season. Why would you do that? Because pole beans are putting all their energy into producing bean after bean after bean. They might need a boost. But generally, beans in my garden are happy to grow and produce. So, I usually plant, pick and eat. A note about weeding around beans. As I mentioned, the plants have shallow roots so you can hoe around them to remove small weeds and grasses. But don’t get too vigorous or go too deep. With their fairly weak root systems, deep or close cultivation damages the roots and could delay or reduce yields of beans. Next week a look at bugs that bug beans and how to handle them. This entry was posted in Gardening Tips, Organic Gardening and tagged Green bean, grow green beans, how to grow green beans, mexican bean beetles, string beans, vegetarian. Bookmark the permalink.